One of the largest furniture and design companies in the US was looking to free up internal IT team members from the time-intensive demands of staffing a help desk. Discover how the "GHDSI Difference" helped the furniture retail giant better allocate and utilize its in-house technology resources, thus freeing up the team to work on more complicated tasks as the demands of rapid growth continue. 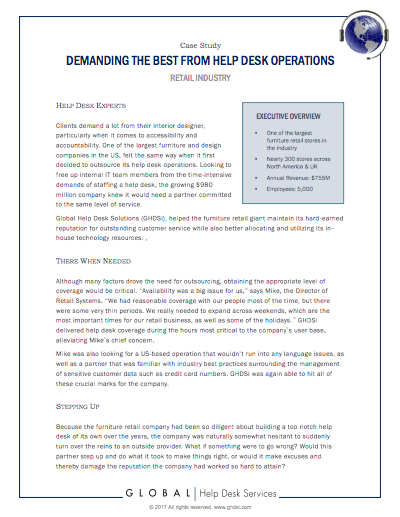 See why partnering with GHDSI has been a successful decision and why the company thinks that "If someone had the same needs we had, Global Help Desk would be a great option.” - Mike, Director of Retail Systems. Simply fill in your information to access the digital version of the case study.